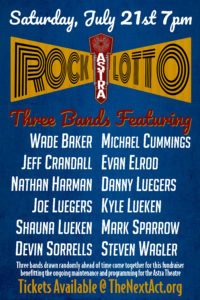 Bands for the area and region’s first “Rock Lotto” event at the Astra Theatre on July 21 have been formed. 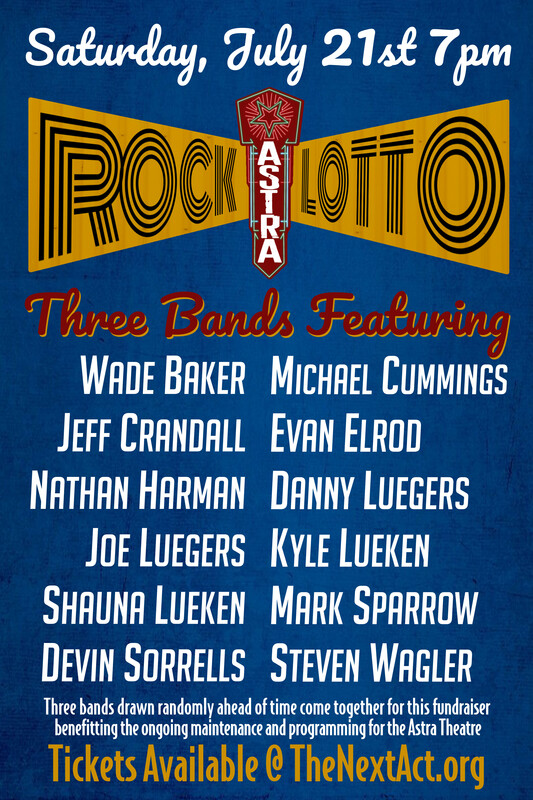 Musicians from local and regional bands The High Road, Fun Guns, Sparrow and Crandall, and more have been divided up through a unique lottery-style draft held on Friday, June 29, 2018, at the Astra Theatre. The 12 total musicians are now divided up into three groups of four. At the drawing, the three drummers served as team “captains”, each of which then randomly drew one-at-a-time for a bass player and then two additional musicians. Each band will be allowed one “wild card” option to more fully round out their band. The newly-formed bands have between now and July 21 to rehearse 30 minutes of material to perform on the Astra’s Jim and Pat Thyen Performance Stage on Saturday, July 21. Doors for the event open at 6:15 p.m., with the first band taking the stage at 7 p.m. Tickets are $10 and are available now at www.TheNextAct.org. All net proceeds will benefit the Astra’s ongoing maintenance and programming funds. With the purchase of a ticket, audience members will receive a voucher worth ten points to vote for their favorite band. Additional “votes” can be given in the form of tips, with each dollar counting as a vote. The band accumulating the most votes will win the Astra Theatre and Next Act’s first “Rock Lotto”. Band 1: Wade Baker, Michael Cummings, Evan Elrod, Danny Luegers. Band 2: Kyle Lueken, Shauna Lueken, Devin Sorrells, Mark Sparrow. Band 3: Jeff Crandall, Nathan Harman, Joe Luegers, Steven Wagler. Tickets are still available for a July 18 screening of The Princess Bride, an intimate (and rare) October 6 solo acoustic performance by critically-acclaimed Americana musician Pokey LaFarge, and a November 3 acoustic trio performance by two-time Grammy winner Rodney Crowell. Tickets for all events at the historic Astra Theatre in Jasper, Indiana, can be purchased at www.AstraTheatre.eventbrite.com.